We help you conference better with Spacious Conference Hall with uninterrupted power supply & complete conferencing equipment. Hotel Moti Mahal while planning a seminar or conference, presents fabulous food & magnificent centrally air-conditioned conference or seminar hall. We are greatly pleased to help you with all your planning requirements. Whether it is formal or informal event, we set a pleasant atmosphere all around. To plan a seminar, meeting or workshop, our executives plan everything to the last detail. We can set up our conference hall to suit any style you require - theatre style, classroom style, U Shape or cluster Shape. our Conference hall is equipped with ultra modern Audiovisual systems supported with stable to take care of meetings, workshops, demonstration and seminars. Looking at the business needs of all entrepreneurs and large corporate, we have established facilities that cater to the requirements of today's tension prone fast moving businessman. 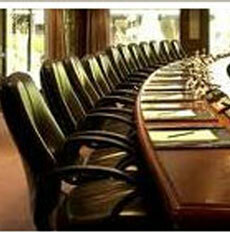 The hotel offers comprehensive Conference services. The package includes a choice of conference from 10 to 50 persons with state of the art facilities like communication assistance, email, fax and internet. Audio Visual equipment for presentations is also available on demand.